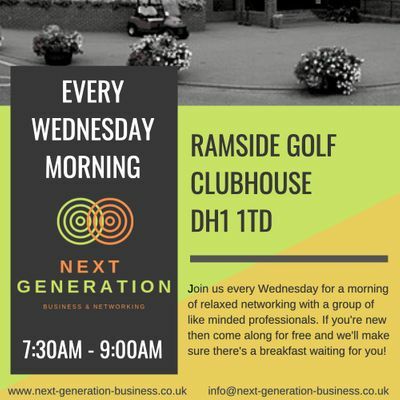 Come and join a group of like minded business people at Ramside Golf Club House every Wednesday morning from 7:30am - 9:00am. If this is your first time attending then it's completely free and includes breakfast too! If your position is already full at this group then please contact us (aW5mbyB8IG5leHQtZ2VuZXJhdGlvbi1idXNpbmVzcyAhIGNvICEgdWs=) and we can point you in the right direction of another group nearby which may still be available.